The first part of the exhibition, "Prehistorical Prague", presents the ancient history of the city and offers an insight into the lives of the inhabitants of Prague from prehistoric beginnings to the time of arrival of the Slavs. 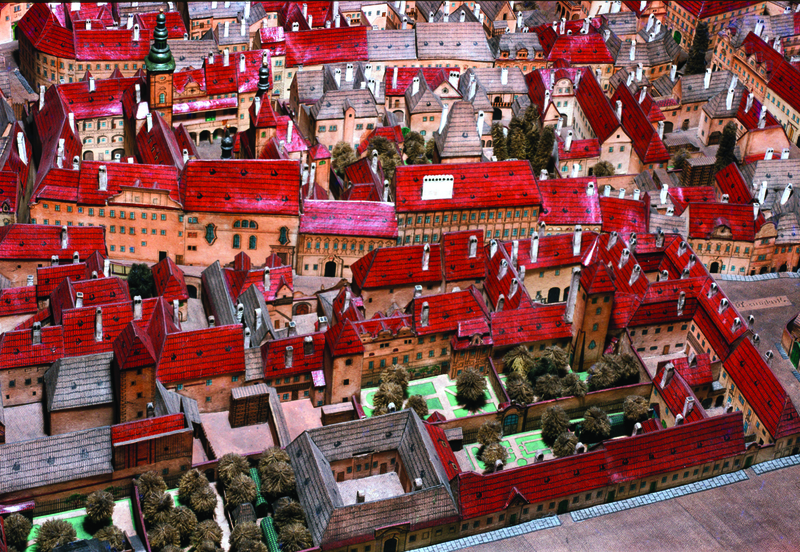 The "Medieval Prague" section is dedicated to the foundation of Prague Castle, Vyšehrad, settlements from the 9th to the 12th centuries, the founding of the Old Town and the Lesser Town in the 13th century, the Castle District and the New Town in the 14th century, as well as the period during the Hussite wars. Prague from the Late Middle Ages to the Modern Era” is an excursion into the second half of the 15th and 16th centuries - the period of late Gothic and the penetration of Renaissance ideals and arts into Prague, the time in the early 1580s when Emperor Rudolf II, patron and art collector, moved into Prague Castle. Another part of the exhibition, “Baroque Prague”, presents a collection of Baroque sculpture and painting. The most valuable collections from this period include hundreds of artefacts from the property of Prague guild corporations. A tactile exhibition entitled "Primer" offers visitors the chance to get their hands on models of Prague’s most important monuments from the Romanesque and Gothic periods.